The penultimate poll in a series by Survation for the Daily Record ahead of the 2016 Scottish Parliament election continues to look bleak for Scottish Labour, with Kezia Dugdale’s party down one per cent in the Holyrood constituency voting intention since our last poll in March and four points down since the equivalent poll in February. While the SNP remain strong, some 35 points ahead of second-placed Labour, the Conservatives are yet to make any noticeable progress in the constituency voting intention as we enter the final two weeks of the campaign. Following on from our March poll there have been two televised debates between party leaders in Scotland which appear to have had some effect on our Leadership Favourability Ratings. Some things remained constant, however; for the fourth month in a row, SNP leader Nicola Sturgeon was the only politician with a positive net favourability rating (+23), with the next ‘best’ rating once again coming from the Co-convenor of the Scottish Green Party, Patrick Harvie (-2%). The changes seems to have come from respondents’ awareness of Scottish leaders, although this seems to have been to the detriment of their favourability. Each of Willie Rennie (-3%), Kezia Dugdale (-4%), Ruth Davidson (-2%) and Patrick Harvie (-1%) enjoyed drops in the proportion of Scots who had not heard of them or didn’t know how to rate their favourability, but each in turn suffered a drop in their net favourability, Dugdale’s and Davidson’s dropping by 5 points apiece. Unsurprisingly, in the wake of the Panama Papers story, David Cameron suffered the greatest drop in favourability out of any of the leaders, down 11 points to -46%. 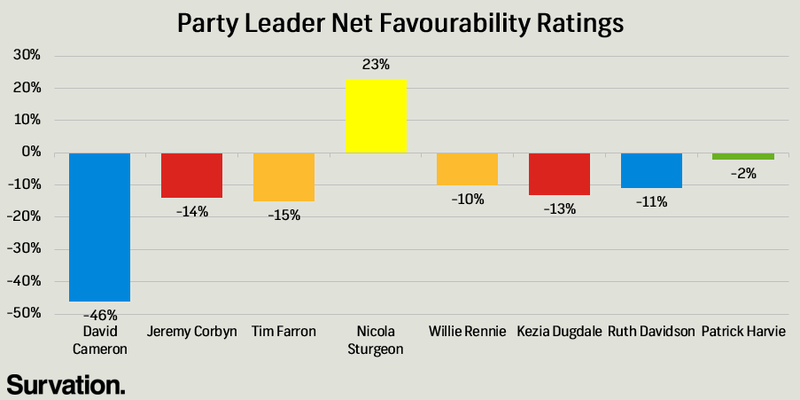 In contrast, Jeremy Corbyn enjoyed his best favourability score since the series began in January (-14%) and helping close the favourability gap between Westminster and Holyrood leaders. Despite the neck-and-neck showing in the Holyrood Constituency Voting Intention between Labour and the Conservatives, it seems that Scots both want and expect Labour to come in second place. Over a third (38%) of Scots want Labour to come in second place, compared to just under a quarter (23%) who want the Green Party and a fifth (21%) who want the Conservatives to come second. In contrast, a majority (58%) expect Labour to come in second place compared again to a fifth (21%) who expect the Conservatives and just 9% who expect the Greens to come second. 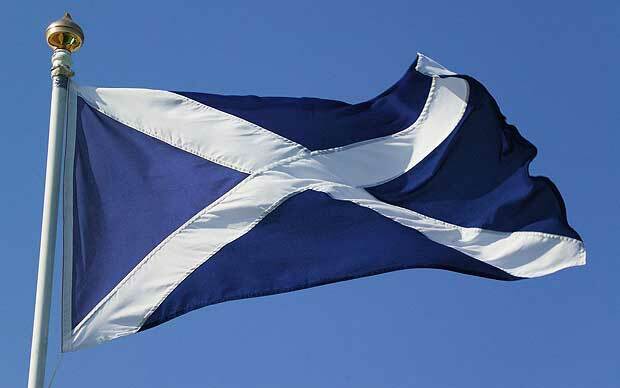 Survation interviewed 1,005 Scottish adults aged 16+ between 15th – 20th April 2016.